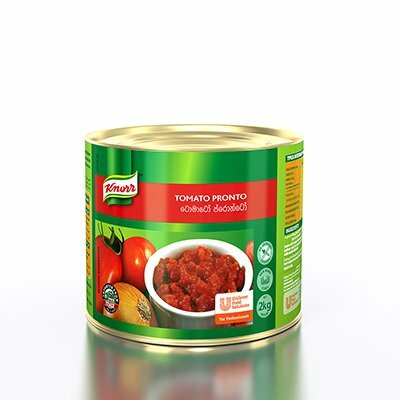 Knorr Tomato Pronto is made from sun-ripened tomatoes from the Emilia-Romagna region in Italy. They're cooked, peeled, de-seeded, and cut into a unique concasse, giving you the perfect base for tomato sauces and soups. Tomatoes (95%), vegetable oil (sunflower seed), salt, water, sugar, dried onion, acidity regulator (citric acid). Use as a base sauce. Store in a cool and dry place, away from humidity and direct sunlight, at temperatures Max 25°C.